It pains us to say, but the real estate industry has its share of shysters, shady characters, and shameful behavior. A good name is worth it’s weight in gold in this business or, in our case, platinum. You might already be familiar with the name Jason Hartman. He’s the creator of “The Complete Solution for Real Estate Investors,” and CEO and founder of the Platinum Properties Investor Network. 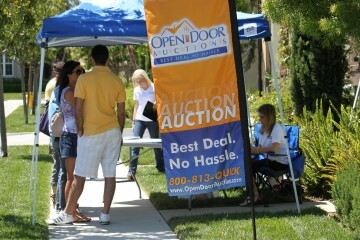 With Open Door Auctions, Hartman is putting into practice a unique approach to buying and selling properties. As a real estate agent with more than two decades of experience in every kind of market imaginable, he knew there had to be better way to arrange deals than the old-fashioned real estate industry had been doing for more than century. Think about it. Little has changed in the method traditional real estate deals are arranged since the Multiple Listing Service had its beginnings in the late 1800’s. How many businesses would survive today changing nothing in over one hundred years? Old-fashioned real estate is dysfunctional beyond belief. Buyers hate it. Sellers hate it. You can bet agents hate it. What should be a simple way of bringing buyers and sellers together has turned into a Three Stooges routine. Things need to change. Thanks to Open Door Auctions, things ARE changing. The old network of real estate agents might take months to reach an agreement on a property you’re interested in. Our entire sales process takes two weeks. You can bid on a house and find out THAT DAY whether your offer was accepted or not. And we’d like to point out that Hartman’s new company is not some fly-by-night operation that will be gone tomorrow. This is THE future of real estate. He’s staking his reputation on it, and when the Hartman name is behind a brand, expect an exceptional, innovative, common sense experience. Won’t that be a tall, cool drink of water on a hot day when it comes to buying property? If you’re ready to experience a real estate transaction the way it should be done, visit Open Door Auctions at www.OpenDoorAuctions.com (insert live link) and browse our database of available properties (Flickr / .